That time was last week. 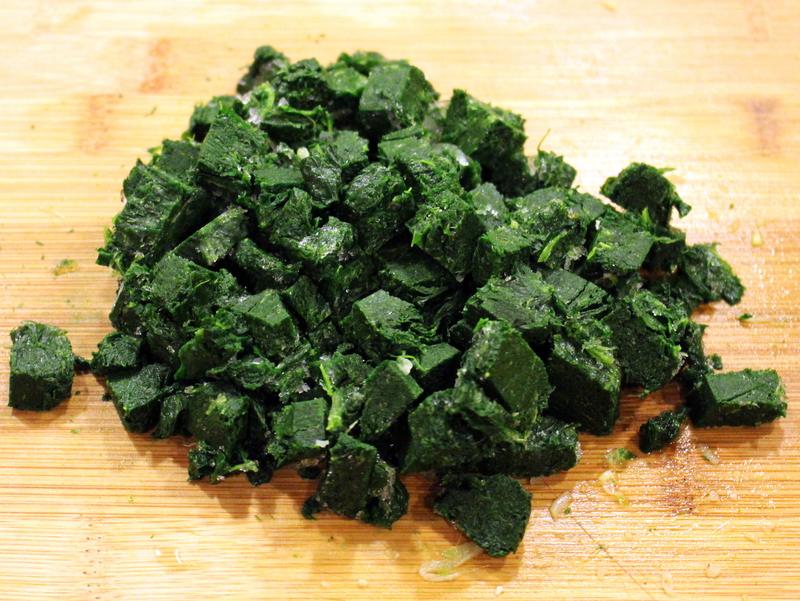 We just had the first fresh spinach out of the garden in a salad the night before, when I discovered I still had frozen spinach from last spring in the deep freeze. 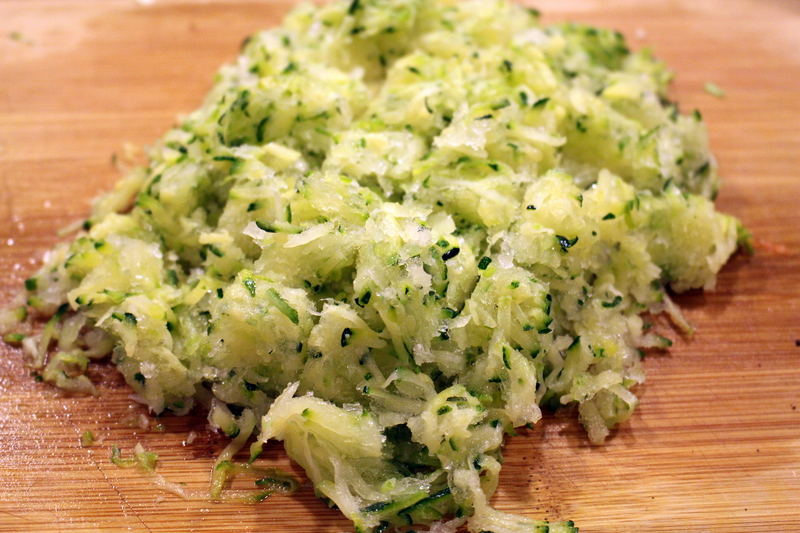 Not to mention frozen grated zucchini and a whole lot of other vegetables that I froze last summer. It’s time to use them before they get lapped by this year’s garden veggies! Time to make my signature vegetable soup. Years ago, I found a basic vegetable soup recipe in a women’s magazine – I don’t remember which one, but Glamour or Cosmopolitan were what I read at the time. 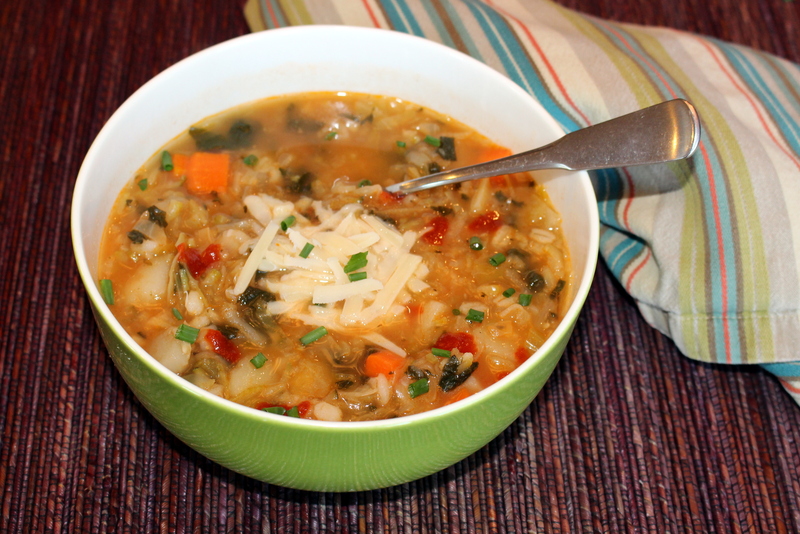 The recipe was part of some diet plan – the “cabbage soup diet” was a thing back in the day – but makes a delicious soup, nonetheless. And the basic recipe can be augmented with whatever other vegetables are on hand. I no longer have the copy of the recipe I tore out of the magazine all those years ago. In fact, I haven’t followed an actual recipe for years. I know I’ve made a few tweaks. For one thing, I remember the original recipe calling for water and bouillon cubes (does anyone even remember what those are?) instead of stock or broth. I usually use homemade soup stock or purchased beef or chicken broth. For a vegetarian version, use vegetable broth. Use as much or as little of the ingredients as you wish. For a thicker soup or more servings, add more of everything. Heat olive oil in heavy soup pot. Add onion and cook for 5 minutes until tender and golden, stirring frequently. Add celery, carrot, garlic, thyme, salt and pepper, and continue to cook until vegetables soften, stirring occasionally, about 5-10 more minutes. Add garlic and stir for one minute. Add remaining ingredients and stir to combine. Bring soup to a boil, then cover and reduce heat. 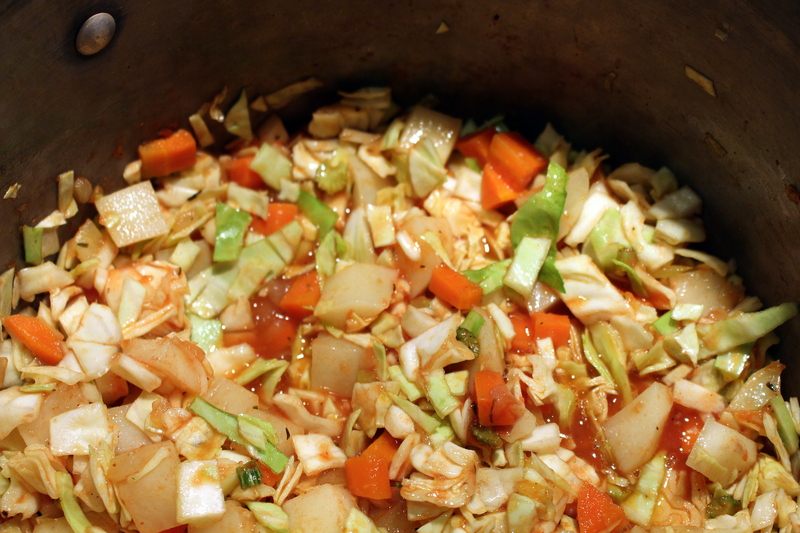 Simmer for 30 minutes or until potato and cabbage are tender. Season with salt and pepper to taste. I like to top this soup with grated Parmesan cheese and a few drops of sriracha sauce. Serve it with cheese toast for a great Meatless Monday meal. Do you have a signature soup? Tell us about it in the comments section below. This entry was posted in Cooking with Garden Produce and tagged cabbage, frozen vegetables, home cooking, recipe, soup, vegetarian by Deborah Neyens. Bookmark the permalink.